Many auto nerds breed passion for vintage cars or bikes, but only a few lucky ones who do not refrain from digging deep into their pockets get a chance to own one. Here is an automotive table from Statuedecor that gives the not-so-rich automobile enthusiasts an opportunity to satisfy their fascination for vintage autos. 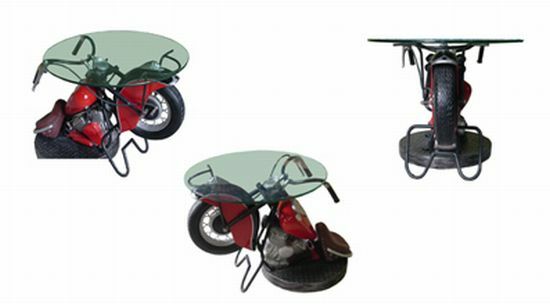 Called the “Vintage Bike Side Table,” the automotive furniture unit includes an iconic fender, detailed engine and Indian emblem on the fender with a glass shelf, offering a classic look to any home bar, entertainment area or restaurant. Finished with resin reinforced with fiberglass and metal, the handcrafted table measures 31.5″L x 24″D x 22.5″H. The vintage side table can be yours for $450 only. This entry was posted on Wednesday, August 19th, 2009 at 10:00 pm	and is filed under Interesting Stuff. You can leave a response, or trackback from your own site. 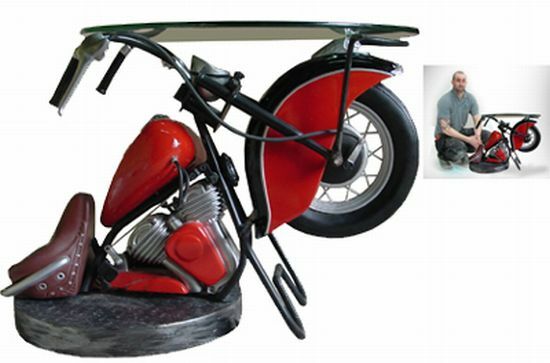 2 Responses to "Vintage Bike Side Table for an auto nerd’s abode"
Harley’s appeal still lies more in image than in performance, however, and fashion-driven companies are vulnerable to changes of fashion and generation. The future of Harley’s business is in Gen Xers and Yers, not exactly the forte of a company attuned to baby-boomers’ rhythms and values. Naturally the boomers’ kids want to ride anything but the old man’s model. They’re drawn to machines that are the anti-Harley. American sales of light sport bikes, aimed at 25- to 34-year-old men, increased 90% from 1998 to 2001. Suzuki, Honda, Yamaha, and Kawasaki have a combined 92% of that market. The 114,000 bikes sold in the category still pale beside the 262,000 in Harley’s cruiser segment. But the youth of America have spoken. They prefer sleeker, sportier machines than the Harley hog, and Harley’s brass had better listen. Hi there, are u A mate very recently bought a old smallish cycle, im not even certain what make it is! My other friends are now annoying him and telling him that its a scooter, not a motorcycle! I want to put them in their place seriously what realy is the difference between a bike an a scooter? Can you assist?